Beautifully updated one-story home backing to greenbelt. Every inch of this space has been updated with precision and thoughtfulness and the design was done with love and care in mind for the new owners in the great pocket neighborhood of West Branch. 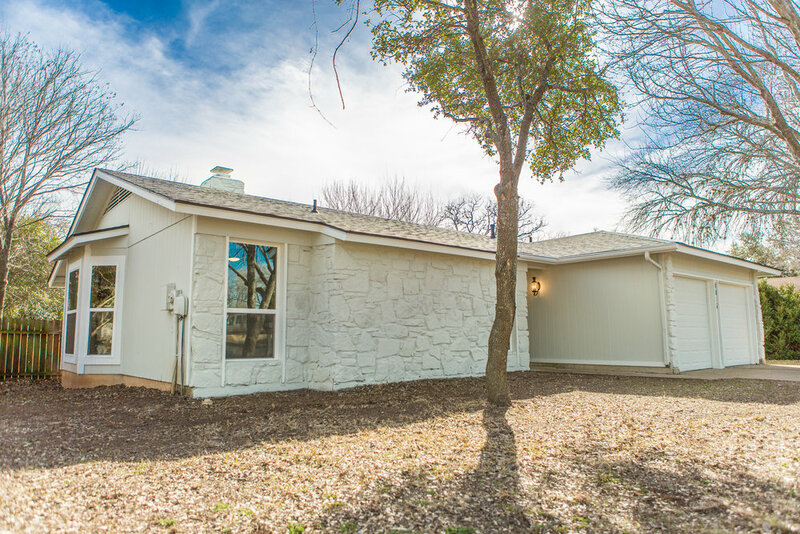 Vaulted ceilings, new windows, paint, designer light fixtures, fans and floors make this home light and bright. Completely updated kitchen with open shelves, new appliances, farmhouse sink and a dreamy Delta Trinsic faucet will make your heart flutter. Bathrooms have been updated with new bathtubs, Delta Trinsic faucets, new toilets, new vanities and complimented with clean and elegant white subway tile. Black fixtures with gold mirrors and marble counter tops add the perfect touch of elegance. Pass through fireplace anchors the home, tying the living room to the kitchen and dining. New roof, exterior paint, and foundation repaired with transferable warranty. Close to everything—Whole Foods, Lifetime Fitness, HEB, Costco, Arbor Trails.